On a daily basis most people have many tasks to perform, people to attend to and deadlines to meet. On top of all the daily responsibilities come those unexpected stresses like the car not starting, the kids are sick or the bathroom drawer fell out for the umpteenth time this week. What if I told you that you could eliminate one of those problems with Phoenix bathroom remodeling? Many problems can occur in your bathroom over time: water damage, mold, cabinets break, drawers fall apart, and you lose space to store all of your bathroom amenities. Not to mention that your idea of a great bathroom just 5 or 10 years ago might be very different from what it is today. When you choose Republic West Remodeling to do your Phoenix bathroom remodeling we can help you get your bathroom back with a few simple steps. 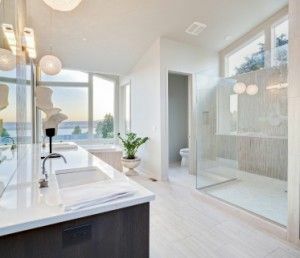 Evaluate how you use your bathroom – We take into account how much time is spent in the bathroom each day, where you brush your teeth, do your hair, who uses that particular bathroom, where you currently store everything and much more. We want your bathroom to be as practical and organized as it is beautiful. Design cabinets and storage space – After we see how you use your bathroom we will custom create the perfect cabinets and storage space. This means a place to store your blow dryer, your tooth brushes, your toiletries, your mustache clippers and so on. No more digging in overloaded, disorganized drawers, there’ll be a place for everything. Make comfort or aesthetic changes – Whether you want heated floors, no fog mirrors or a simple paint update, we can help. Our team of designers will help you pick out everything including accessories, colors, different fixtures and so much more. We want your bathroom to a comfortable and beautiful room in your home. Whether you choose to do one, two or all three of these things, it will make a huge difference on how you view and/or use your bathroom.